The Occupational Training Center is proud to be a certified government contractor under the Ability One Program. The program participants are paid based on the prevailing federal wage determination and are provided a stipend towards the purchase of health and welfare benefits. As a result, adults once dependent on programs, such as Social Security and Medicaid, are able to become independent tax-paying citizens within their communities. The Ability One Program targets product and service contracts within the federal government for transfer to non-profit agencies. These agencies provide job training and employment for individuals with disabilities. The Ability One Program is the largest contracted service and provides the most jobs to individuals with disabilities. The OTC has a summer work program that focuses on the maintenance of the guardrails and medians throughout the County. In conjunction with Rancocas Valley Regional High School, The OTC provides summer employment for recent graduates. The program provides a necessary service while freeing the County to focus on more immediate needs, like roads and bridges. This contract employs 18 individuals and often leads to full-time employment. The OTC secured its first Ability One Program in 1994, signing a contract for food services at the then Falcon Dining Hall on McGuire AFB. 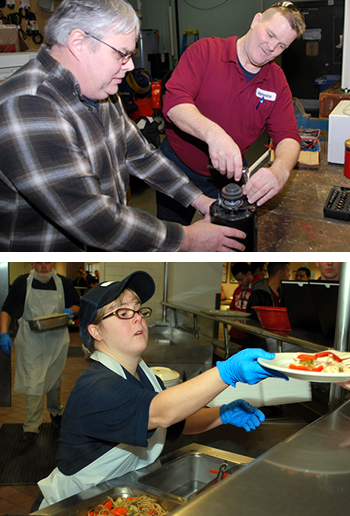 Today, the program provides job training to more than 30 individuals with disabilities. In 1989, the OTC signed its first small custodial contract at the Hughes Justice Complex. Further growing to procure government custodial contracts on the municipal, county, state, and federal level. Today, this contract employs over 200 individuals. Thank you for considering the OTC as your service provider as well as helping to accomplish our mission of, “assisting individuals with disabilities in reaching their maximum potential.” The OTC looks forward to the possibility of providing services for your business no matter how small or large the project may be. For more information contact Matt Jugan 609-267-6677 ext. 169.